People used to call the commercial center of Jackson Heights “Little India.” Now some people call it “Little Tibet.” No simple description of the demographics of the area is possible, however: a single block on 74th Street boasts shops run by and for Bangladeshis, Pakistanis, Indians, Tibetans, and Nepalis. I suspect that many of the Himalayan people—the people from various parts of Nepal, North India, and Bhutan—are happy to embrace Tibet as an approximation of their nationality. Tibet has become something of an ideal, nearly equivalent in many people’s minds with esoteric Buddhism, high-minded pacifism, and the mysteries of a remote location whose history will never be well understood. Thus, all the Nepalese restaurants advertise their Tibetan food first and foremost, as does the Bhutanese restaurant a few blocks away. But one of the pleasures of Little Tibet is that it encompasses so much more. Here is a sampling of Little Tibet restaurants and what they offer. Himalayan Yak frequently hosts events for the local Nepalese and Tibetan communities, with Nepalese bands playing several nights a week, and there is sometimes excitement when an important lama visits for lunch. You can see the peculiarly Tibetan mixing of fun and reverence when the bands jam out pop songs under a large photo of the Dalai Lama encased in an elaborately carved shrine. The sterner face of Padmasambhava, a Buddhist saint, hangs carved in wood next to a sign that reads: “Alcohol, because no good story starts with a salad.” The restaurant draws a wide variety of people. Many of the regulars are Nepalis, but their cultural allegiances are a matter of individual preference. Sometimes a group of young Nepalis comes in wearing cornrows and extra-large T shirts; other times you meet Nepalis here with long hair and beards, tie-dye T shirts, and comfortably expansive bellies. Of course, the restaurant draws a lot of “foreigners” (non-Himalayans) as well. The food here is excellent. Most visitors will be happy with their Tibetan dishes. Their momos are juicy and thick shelled. Get them in soup (mothuk) or with yak meat for a special treat. 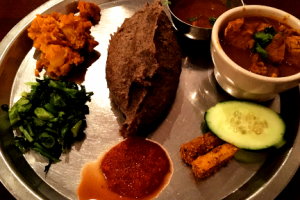 But the restaurant also serves Nepali thalis (see Laliguras below for more), and dedos (dishes featuring buckwheat dough; see Mustang Thakali below for more). Laliguras occupies a sunny little spot on the corner of 76th Street and 36th Avenue. There is a bar along the window and a few tables in the dining room. A lot of people order takeout at Laliguras. One reason to eat at the shop, however, is they will give you free refills on your thali. (Thali is a platter of several items: usually lentils, curry, vegetables, your choice of meat, and rice or buckwheat.) Refills are frequent, and the waitresses are almost insistent. Laliguras is also a good place to sample Newar food (the Newars being the indigenous people of Khatmandu). In particular, you can try a Samayabajee. This is another platter, but the main item is beaten rice, which is dry, flattened rice—a little like uncooked rolled oats. Samayabajee also typically comes with roasted soybeans—a little dry—and meat. 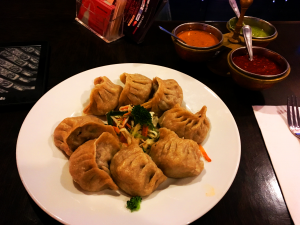 Finally, like most of the Nepalese restaurants in the area, Laliguras has momos and other Tibetan foods. 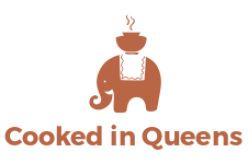 Woodside Café is a funky little transplant from Khatmandu, with a small dining area modestly decorated with Newari carvings and one of the most adventurous menus in the area. Woodside Café is the only place I know of serving momos in pink sauce, a mash-up of Tibetan and Italian cuisine. This is a very satisfying dish, reminiscent of ravioli. For those tolerant of hot foods, Woodside Café has also invented chili momos. These are deep-fried momos immersed in spicy red chili sauce with fried peppers and onions. This is an excellent dish, and unlike anything else I’ve had in the area. But Woodside Café also has a wide selection of traditional Nepali, Tibetan, and Indian dishes. You can try Newari dishes, such as Samaybajee, Newari Thali or roasted soy beans. You can also try dishes from Mustang and other regions high in the mountains of Nepal, such as Dedo. See more on this dish under Mustang Thakali below. But old favorites like momos and chicken thali are very reliable. The atmosphere at Woodside Café is very relaxed and casual. Many of the customers seem to be friends or family, and sometimes it is hard to know who works there and who is visiting. The downside of this is that the waitress may forget about you for quite some time. The television is often tuned to Nepali pop music. Mustang Thakali offers all the Tibetan and Nepalese dishes that you find at most of the Himalayan restaurants around here. But they specialize in dishes from Mustang, the high homeland of the Thakalis. This is characterized by the liberal use of buckwheat, which is one of the few cereals that grows well at Mustang’s elevation. The most well-known of these dishes showcases dedo (or dhido, as Mustang Thakali’s menu spells it). This is mashed buckwheat dampened to make a dough-like mass. 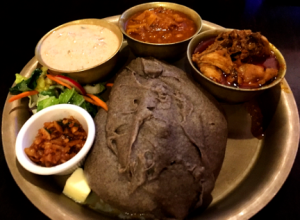 Yhosi has a big dollop of dedo at its center, surrounded by chicken, vegetables, and chutney. 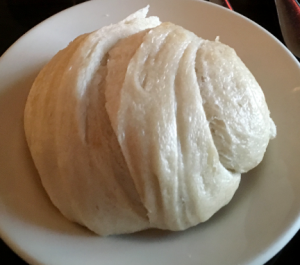 They also serve roti made from buckwheat, and a Tibetan style soup—vegetable alungkhu—including clumps of boiled buckwheat dough. As served, it is a little bland, but the addition of chilies (provided on the side with every soup) brings it to life. The boldly patterned embroidery of the seat backs that line the walls on both sides of the room signal a complete change of experience from the noise and promiscuous mixture of cheap goods—from Wendy’s to momos—sold under the trestle of the 7 train. Once you have stepped into Little Tibet, you might be in Central Asia. 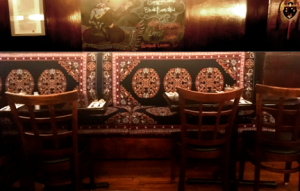 Above these seat backs, all around the room, are framed pieces of Tibetan calligraphy, some of them very beautiful. The ceiling is lined with a strip of bright yellow fabric, a sort of banner commonly seen in Tibetan structures. 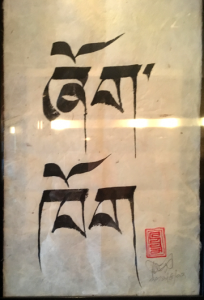 I have been to Little Tibet a few times, and there seem usually to be more “foreigners”—people like me, or Japanese and Chinese—than at the other Tibetan and Nepalese restaurants in Jackson Heights, where most of the customers are Tibetan and Nepalese. That is not to say Tibetans do not frequent the shop; there are always some Tibetans there. 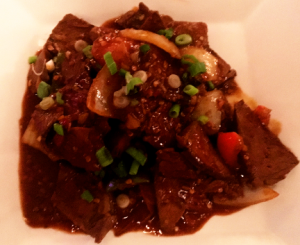 Perhaps Little Tibet better showcases Tibetan culture for a Western audience than many of the other restaurants. 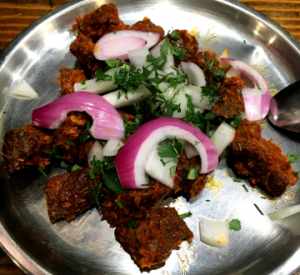 Like Mustang Thakali Kitchen a few blocks north, Little Tibet lovingly curates the items on display in its dining area, and the food is prepared with no less attention to presentation. The traditional aluminum plates that many of the restaurants around here use are replaced with chic white plates. But it is not all about appearance. Some dishes are simply better at Little Tibet than at many of its rivals. For instance, many of the restaurants in Jackson Heights serve tingmo that I suspect they buy premade and heat in a steamer. In any case, they are often not very good. But at Little Tibet they are fluffy and smell freshly cooked. 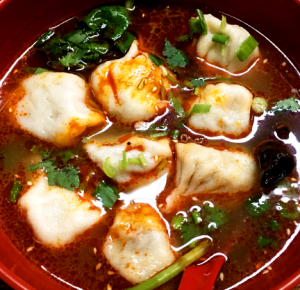 The momos are excellent, with thick shells and soup inside. I have also tried their shaptak ngoepa, beef sautéed in green peppers, chilies, and vegetables—very good, if not distinctly Himalayan. For a special treat, try the tsampa cake. This consists of tsampa pressed into a disc with honey drizzled over it, and a scoop of ice cream dropped over it. The combination of tsampa with honey reminds me a little of homemade almond butter. This second-story restaurant overlooks the hubbub of 74th Street; you can peer out the windows at people window-shopping for saris and Indian bridal gowns or stopping at the Patala momo truck for a snack. Small and sunlit, with plants in the windows, Phayul feels a little like the hospitable abode of a friend, which just happens to have a tiny Tibetan kitchen tucked in the corner. When the owner is present, the effect is complete; she solicitously watches over guests, and guides visitors through less familiar sections of the menu. The food here is excellent. 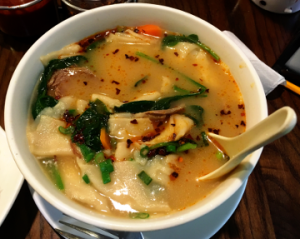 The soups are deliciously spicy, unless you order one of the herbal soups, made with Himalayan herbs. The tingmos are soft and fluffy, and the momos are full of flavor. This is one of the most fun places to eat in the neighborhood. It is hidden in the back of a building, at the end of a hallway surrounded by cell phone shops and jewelers. Small, windowless, and cramped it should not be cheerful, but somehow it is. Many visitors are no doubt drawn by the eccentricity of this arrangement, but I think repeat visitors are hooked by something else. Most dishes at Lhasa Fast Food are excellent. I especially like their mothuk. The tingmo here are really not worth ordering though; they are reheated and tough. I suspect that the remarkably bare kitchen is simply not equipped for fresh-made tingmo. Bhutan’s major contribution to Himalayan cuisine may simply be the demonstration that it is always possible to add more chilies. 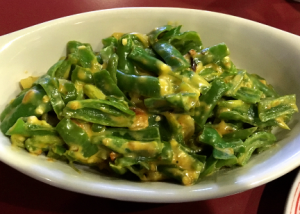 The namesake of Bhutanese Ema Datsi is a dish consisting of fried long green chilies drenched in cheese. This is a restaurant best visited with several friends so you can sample different fiery Bhutanese offerings along with Tibetan standbys like momos, mothuk, and thenthuk—all of which are prepared excellently at Bhutanese Ema Datsi. Service can be a little indifferent, but you can watch music videos from Bhutan as you wait for your food or chat with the owner, who will gladly expound on everything from India’s untapped wealth (all those bridal jewels sitting idle in drawers for life) to the backwardness of US bankruptcy laws (you can give everything to your wife before filing, and then you don’t lose it). 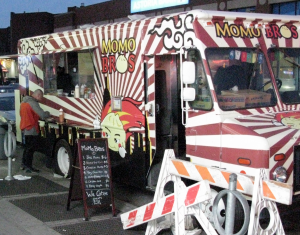 Momo Brothers cannot be beat. Try the jhol momos, momos drowned in spicy stew. Amdo Kitchen has the warmest service you will find. 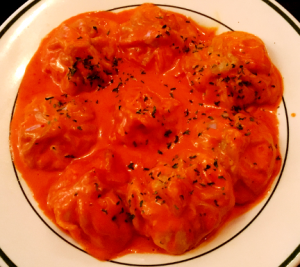 The momos are not always as juicy as they could be. 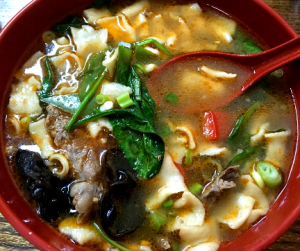 Potala Fresh Food has excellent momos, and slightly surly service.